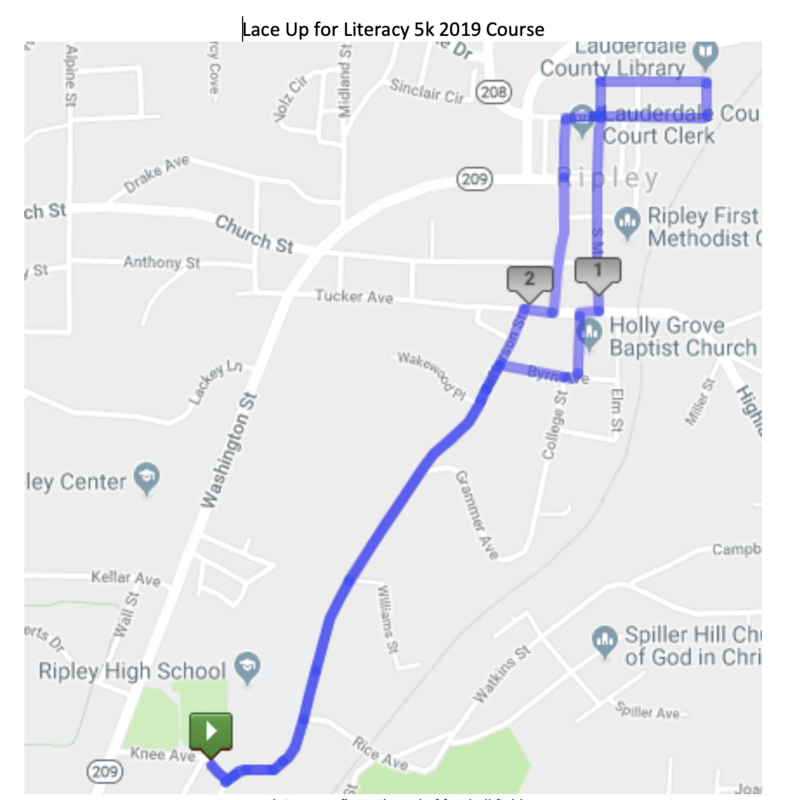 Lauderdale County Schools' 4th Annual Lace Up for Literacy 5K and 1 mile Fun Run will be held this Saturday April 6th with a new venue and new race route. The event will be held at Ripley High School with the 5K planned to kick off at 9am following the presenting of the Colors by RHS JROTC and the singing of the National Anthem by RES student Julia Manley. Parking will be available in the RHS gym parking lot. All other entrances to RHS will be blocked Saturday morning due to the new race routes. The weather looks to be promising for Saturday with a sunny day forecasted and temperatures predicted to be in the 70's. We are looking forward to another fun filled community event and hope that you will make plans to join us as we work to promote literacy in Lauderdale County. Race packets for all pre-registered participants may be picked up at RHS Friday afternoon from 3-6 pm or Saturday morning from 7-8:30 am. Both races will be timed by chip so it is necessary to pick up your shirt and race number prior to the race. If you have not pre-registered, there is still time to get in on the fun. Late registration will also be available during these times. Late registration fees are $20 for any Lauderdale County student and $30 for all adults but there is no guarantee to receive an event t-shirt. Registration will end promptly at 8:30 am Saturday morning to allow staff time to prepare for an on time start of the race. The 5K will begin at 9am sharp from the flagpole at the north end of the football field. The race will proceed in front of the high school, taking a left on Knee Ave to S Jefferson. See the attached race route below for specific route details. As they complete the route, racers will return to the football stadium making the final lap on the track. Ripley Police Department will be helping with traffic control along the route. The 1 mile Fun Run will begin immediately following the 5K and will start at the north end of the football field. Racers will follow directions provided at the race and will end up back tat the football stadium to make the final lap around the track. Awards will be presented on the main stage immediately following the completion of the 1 mile Fun Run. 5K awards will be presented to overall male and female, overall male and female masters, and top 3 male and female in each age bracket. Top 3 male and female in each age bracket will also be awarded to participants in the 1 mile Fun Run. In addition to the races, there will be a variety of activities and booths sponsored by local schools, businesses, and civic groups on the football field. Entertainment will be available on the main stage throughout the day, refeshments available for purchase, free books for children and lots of fun for the kids including a bouncy house and blow up slide. All proceeds from this event will be distributed to all schools in the county for the purchase of library books and other literacy instructional supplies and materials. This will benefit all students as the school district strives to improve literacy proficiency. Lauderdale County school leaders recognize the critical importance of students learning to read by the end of the 3rdgrade. Students who learn to read at an early age are able to spend the rest of their lives reading to learn. Readers become learners and learners become leaders! Research shows that students who cannot read on grade level by 3rdgrade are 4 times less likely to graduate by age 19 than their peers. The effects of not preparing children to read can be devastating to their future as well as the future of this community. Embrace the importance of reading at home with children by reading to or with your child at least 20 minutes every day. Most children whose parents read with them learn to read well and are typically proficient readers by 3rd grade. It's that simple! Volunteer your time at one of our local schools to help mentor a child who needs a little help. Give the schools a call to see how they can use you to help out. Mentor a child in the community; take them to the library; spend time with children. Children are our future! Come out Saturday and enjoy a fun filled day as we work to raise awareness and promote literacy in our schools and in Lauderdale County. If you live along the 5K route, cheer the racers on as they Lace Up and run for this wonderful cause. You may even want to “Bookworm” your neighbor, friend or family member by having our Bookworms appear in their yard and asking them to donate $20 to the Lace Up for Literacy effort to have them removed from their yard and sent to another one. For more information or to have someone “Bookwormed” contact Cynthia Glenn at 731-413-8147 or Michelle Brazier at 731-612-0212. Let's all do what we can to help make Lauderdale County a more literate community! Support Lace Up for Literacy this Saturday, April 6!